We have 2 adorable felines that I love dearly. We also have a black leather sectional sofa that I also love very much. I've never been the type of person that will allow an animal to destroy a piece of furniture. Yet I understand cats have a natural desire to scratch on something to sharpen their claws. So I bought our kittie, Cole and Puck, their very own chair. I picked it up in the As-Is section of Ikea for 40 bucks. It's made of natural materials and is safer for the environment compared to those cat scratching towers which have petroleum based carpets connected to them and will continue to put out harmful toxic fumes into the air of your home. Not to mention they are so expensive! 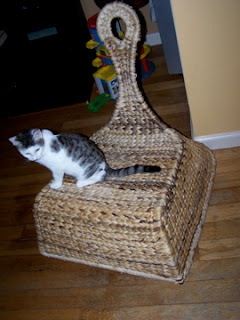 So take advantage of all the summer clearance sales that are going on right now and if you spot a wicker chair in not the greatest shape but for dirt cheap, snag it up and your felines will thank you.